Alex and I decided to stock our bar cart as an early wedding anniversary gift to each other this year. We're not very traditional when it comes to gift-giving (last year we got Aengus) and we're horrible at keeping secrets from each other so it seemed like a good fit. We went to the liquor store on a whim on Friday after work and decided since we were there we'd go all in! We've never had a fully stocked bar cart since we've been married so the summer seemed like a good time to finally fill it with all our favorites. Our bar cart was a wedding gift from our friends Christine and Autumn. I absolutely love it! It fits our style so well. We've always had a bottle or two of whiskey, a cocktail guide book, and way too many growlers and beer glasses on hand but it was lacking the staples. 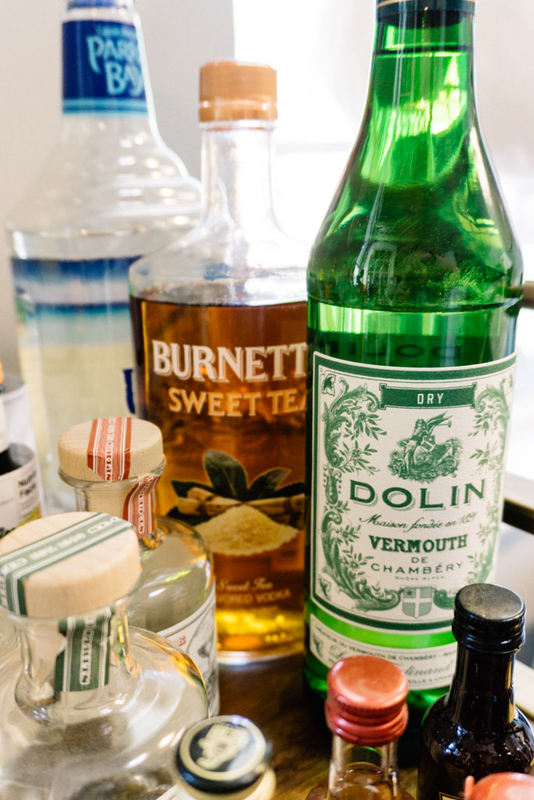 Before you get started, the first thing to remember is that you should only stock your bar with liquor you enjoy drinking! It can get expensive and you won't want to waste it. Of course you'll have people over from time to time that you want to impress, but let them bring their own bottles! Some of our favorite liquors are really cheap while others stretch our pockets a bit more. All that matters is that you have fun mixing! Now that you've got the basics, it's time to mix your favorite drinks! What's your favorite drink? Leave us some recipes to try out this summer in the comments!